Who? A return to Victor Serge – full-time revolutionary, part-time ultra-pessimist. What? 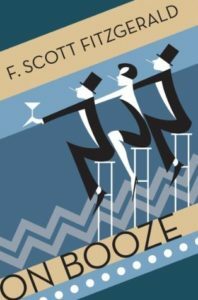 His final novel, a hallucinatory swirl of twentieth century horrors. When? 1947, shortly before his death in Mexico City. How? Unforgiving Years is structured symphonically, with four disparate movements connected thematically and stylistically: ‘The Secret Agent’ [set in prewar Paris], ‘The Flame Beneath the Snow’ [Leningrad under siege], ‘Brigitte, Lightning, Lilacs’ [the fall of Berlin] and ‘Journey’s End’ [postwar rural Mexico]. Why? Unforgiving Years represents the most intense reading experience I’ve had during the past year of TARP. It absorbed a month of my reading life, each page demanding complete attention and staying with me well after reading. It is one of the bleakest views of twentieth century Europe imaginable; it is in fact a nightmare. The few glimmers of hope that shine through the enduring pessimism provide only minor relief from Serge’s complete lack of levity and utter Franco-Russian philosophical bent. The Years he describes are heavy, black and unrelentingly cruel. His toll on the reader is equally unforgiving. Impossible to forget. 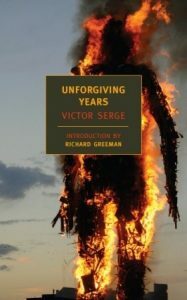 Unforgiving Years is available as an NYRB paperback, translated and introduced by Richard Greeman. Who? Mikhail Sholokhov, celebrated writer of Cossack stock, soldier and uber-realist of a socialist bent. What? 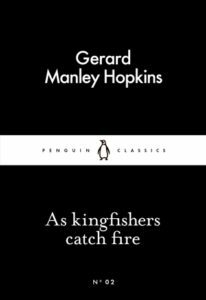 566 pages of Don Cossack life, wending its epic way through the turbulence of World War I, the Russian Revolution and the following Russian Civil War. When? 1929, and since ‘one of Russia’s most sacred works of literature’ [Independent]. How? Sholokhov leads us through peacetime and war-upon-war with equal detachment, truly epic, truly Russian. Why? Comparisons to Tolstoy are natural, let’s not waste time with them. Sholokhov builds a picture of Russian life that surpasses most other socialist realist in its compassion for the Cossacks, and, like Gladkov’s Cement, maintains a level of critique uncompromised by the book’s political goals. It is however, incredibly long, and wait – where’s the protagonist gone? Where’s his wife and lover? And who on earth are all these people? Who cares? We will never know. That, perhaps, is the ultimate essence of the Russian epic. 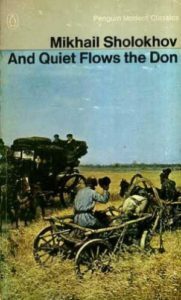 And Quiet Flows the Don is available as a Penguin Modern Classics paperback, in translation by Stephen Garry. Who? Andre Breton, the founder of Surrealism, friend of the famous, all-round Frenchie. What? A sort-of novel, a mix of fact and fiction, including 44 photographs illustrating the history, art and life surrounding Breton’s relationship with the enigma ‘Nadja’. When? 1928, and screaming Parisian chic. How? Breton structures his novel in several disparate, concrete sections, moving suddenly from ramblings about Paris life to anecdotes on his lover to musings on existence and psychiatry. Its scattyness however is one of Nadja‘s primary draws. Why? Nadja is, using a sideways motion, a powerful story delicately told. 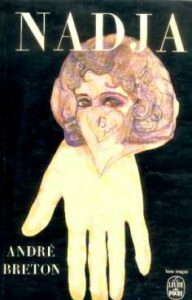 Disregarding Breton’s experiments in form and style, the account of his changing attitude to his lover, as well as her psychological demise, is completely unsentimental even in its fantasy. The beauty of Nadja is, as he implies, ‘CONVULSIVE’, in as much as the emotions evoked by it are as erratic as the subject herself. Breton consistently dodges expectation by jumping from the banal to the existential, the everyday to the extraordinary, and does so in a way that brings out the power of chance in the real world. Breton is not bound by the Surrealist manifesto he once espoused; in fact, he is more tethered to reality than he might like to admit. The wonderfully tragic Nadja is available as a Penguin Modern Classics paperback in translation by Richard Howard and with an introduction by Mark Polizzotti. Pleased to announce my inclusion in the latest issue of Cake, put together by my own darling Lancaster University. Who? Richard Crossman MP (now dead) brings together confessionals from across the international socialist landscape: Arthur Koestler [Germany], Ignazio Silone [Italy], Louis Fischer [USA], Andre Gide [France], Sir Stephen Spender [UK] and Richard Wright [USA] – a merry bunch. What? A compilation of testimonal essays from literary folk who once loved Communism, and then didn’t. A few of lads changed their minds after visiting the Soviet Union in the 1930s, which is probably fair. When? Compiled in 1949. The copy in front of me is older than most grandparents. How? The essays, lucid to the point of depression, are separated into two categories: ‘The Initiates’ and the ‘Worshippers From Afar’, that is (as far as I can remember), those who joined the Party proper and those who didn’t bother. Why? As a study of Communism as a political concept, the title is misleading in its level of usefulness. Rather than confront any flaws in the core tenets of the idea, most of the contributors explain their falling away from the herd in terms of their alienation with the Party itself. Their disillusionment is sourced almost completely in the international Communist movement’s refusal to admit basic truths, including the truths about its own destructive capabilities. Only Stephen Spender lends a few paragraphs to the anti-individual nature of Communism itself, and even he fell out with the Party on social grounds. The essays then are more a reflection on how the international movement failed to assimilate with the USSR, and consequently failed to achieve normative, non-repressive consistency within itself. The failure of the Party however is far from singular. In that sense, the god of the planned cultural economy has, for better or worse, failed. 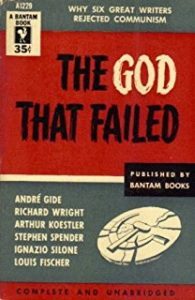 The God That Failed, though long out of print, can be hunted down as a Hamish Hamilton hardback. Who? Original socialist realist engineer-of-the-soul Fyodor Vasilievich Gladkov, founding father of one of world literature’s most chequered movements. What? An intense, populist political novel on which countless others would be modeled: the tale of a homo sovieticus finding his way in Lenin’s brave new world. When? 1925, in the midst of the New Economic Policy, designed to revitalise industry and trade. How? Gladkov’s style, especially in his choice of fixtures for the narrative arc, is difficult to pin down. His frequent descriptions of natural and industrial settings are ambiguous in their bias; both are described as being places both alive and dead, both are in need of radical transformation under Communist will. His characters are complex caricatures, functionaries, often painted with broad judgemental strokes but lacking believable emotional depth. The action is driving, well-paced, but burdened with ideology and with a contorted logic. Cement, though not especially well-written, moves with a fascinating and unusual impetus. Why? The most shocking aspect of Cement, in light of its place as the forerunner of the socialist realist genre, is how critical Gladkov is of the Communist infrastructure of the 1920s. I had sat down with Cement expecting a pure, magnanimous piece of propaganda, but the world Gladkov describes is sincerely bereft of idealisation, even in its gross generalisations. His portrayal of the bureaucratic mafioso within the Party is uncompromising, as is his descriptions of the suffering inflicted on ‘former people’ (the bourgeoisie, kulaks, etc. ), the savagery of the Russian proletariat, the pointless cruelty of the show trial, the linguistic black hole that was ‘Sovietese’, the failure of the childcare system, the inconsistent logic of the New Economic Policy, and so on and so on. The country to which Gladkov dedicates his passion is one not just in need of development, but one that demonstrates inherent flaws whose dangerous influence remains even at the conclusion of the novel. In this sense, Gladkov achieves a moral ambiguity I am astounded was so lauded by the regime for such a long time. Cement is an incredibly important and engaging read, though perhaps not for the reasons it intends. 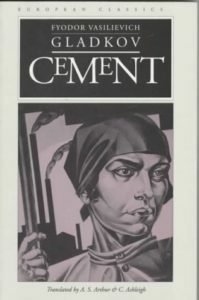 Cement, though out of print in English, is available somewhere as a Northwestern University Press paperback, in translation by A.S. Arthur and C. Ashleigh. Who? Georges Perec, French puzzler and author of Life: A User’s Manual (long and boring) and the lipogrammatical A Void, the book sans ‘E’ (short and clever). What? 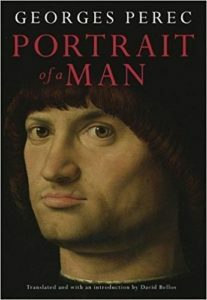 His long-lost first novel, a claustrophobic teaser focusing on a forgery of Antonello da Messina’s portraiture. Also features a good old-fashioned murder. When? 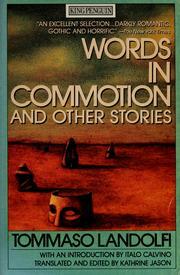 Written in the 1950s, rejected by publishers, lost for ages, and not released until well after Perec was mort. The story of its discovery is a tale in itself, and can be found in Guardian-speak right here. How? Perec is as elusive and jumbled as you’d expect, though his use of jumbledness is expert considering he was only 24 when he wrote the thing. Why? I couldn’t be disappointed by the fact that almost nothing happens in Portrait of a Man. There is a murder, there is a love interest, there is a guy locked in a basement painting the Old Masters, but essentially, the lack of action is the whole draw. Perec’s writing is as always encyclopaedic in scope, ambitious in timbre and absolutely intellectually-inviting. Though it could never stand up to the inventive playfulness of A Void, A Portrait of a Man remains a static mini-masterpiece. Portrait of a Man is available as a Maclehose Press hardback, translated and introduced by David Bellos.